The funny side of this Winter Session 2018! Anyway, point is not food--my favourite topic, but the session that concluded yesterday. If you need technical happenings of what happened & how it unfolded, please read newspapers of the last 8 days! In Marathi, Lokmat covered all the possible happenings hands down as they had a team of more than 4 journalists in Vidhan Bhavan premises. Two covered the upper and lower houses shift wise and two covered the premises, in short, liasoning and maintaining PR. The first week began with a boom. Two days of holiday owing to Eid & Gurupurab and rest three days in just adjournment of both the houses over the reservation issue. We all reached late, left early. Opposition in the lower house only chanted one mantra, table the bill on Maratha reservation and let a discussion happen. But as smart and snooty the Government is, it was firm on its ground that only the Action Taken Report would be tabled and the bill would be passed without any discussion. This happened exactly on the 7th day and as decided it was passed in both the houses. The credit of course for this floor management entirely goes to our CM. In midst of getting house adjourned regularly, I saw a new trend this time... On many occasions during the ruckus, opposition members lifted the Rajdand to show their protest. What I recollect, in the last government ex Speaker Dilip Walse Patil had suspended 3 of BJP's & SS's MLA's for doing so till that particular session got over, unlike this time. Ajab Sarkar hai na...Anyways, on one particular day, when Nana (Haribhau Bagde) was on the chair, Congress's Naseem Khan wanted to speak for which he was raising his hand for a long time....a pattern followed by MLA's to seek speakers attention; but Nana apart from Khan was giving everyone their turn to speak on a particular issue. Frustrated and angry, Naseem Khan stood up and with vengeance & anger and on top of his voice he screamed at the Speaker whilst making some rude gestures by his hand. This angered Minister Girish Bapat to know extend who immediately registered his protest against Khan. That was the first time, I guess I saw Bapat shouting in the house and getting red faced all these years. Also, for the first time I saw "bhaichara" in the house. "Muslims should get reservation too" asserted Hindu MLA's. People made fun of Dr. Jitendra Ahwad by tagging pen names such as "Jittudddin" on social media but for me, he was doing his job. Admist rumours of his closest associate Najeeb who helped Ahwad capture Mumbra like never before, joining ShivSena, Ahwad's frustration and anger could be seen on all 8 days. Never he got enough opportunity to speak in the house nor his bosses allocated important topics to him to which he is very good at. A power packed MLA who has great oratory skills was yet again, asked to remain silent. By the way one of the boss of NCP, Jayant Patil looked younger than his age than he is. Must be the weird "hair weaving" he has got it done. I'm sure he must have got it done in Sangli, he should asked his sons who travel to London regularly... But I still prefer Uday Samant with these artificial hair to Jayant Patil. At least, Samant still has that child-like innocence on his face. CM's master stroke was taming Ajit Pawar yet again. I must agree, I have never seen CM so tensed in this sessions against all others put together. The Maratha, OBC & Dhangar reservation along with the drought in the state and 26/11 I am sure CM has lost a lot of sleep in these 8 days. To top that, the command of running the CMO was with Abhimanyu Pawar, and the cabin next to the CM was more occupied with Laturkar's than other staff's. I know he wants the ticket for upcoming 2019 but....Sumit Wankhede was conspicuous with his absence after first 2 days but later it was learnt he had a wedding of close family member to attend too...CM & we missed you Sumit bhau! As for IAS, I don't know where do they sit apart from Pravin Pardeshi and Bhushan Gagrani. I did not see most of them apart from few of them who showed up during the question /answer session when their department's topic was involved. On to the famous lunches now....If it was Congress's Satej (Bunty) Patil in the last government, this 5 years award for feeding guests goes to none other than NCP's Dhananjay Munde--- and yes like Bunty Patil's team even Munde's team welcomed with open arms whosoever came to their cabin for lunch. PS Prashant Bhamre take a bow for that. Some of my body weight is thanks to you too now...Had you not been so welcoming even I would have had a body like Minister Vishnu Savra today. Minister Girish Bapat has the most "satvik" dabba of all of them. Bawankule, is another person with a big dabba and heart too...Some of my colleagues were joking that Minister Eknath Shinde is so corrupt that he charges an entry fee whosoever comes to his cabin to eat...Jokes apart, if you for once happen to have a round in Vidhan Bhavan the aroma of food is the only bets thing you smell here. Pankaja Munde seemed to lost a lot of weight after her overseas trip in the US recently. For a change, her hairdo and dressing sense made sense to me. I think the next time you guys see Minister Pravin Pote Patil (for those who don't know he is our MoS PWD) try searching for his neck. His face is directly connected to the lower body such is the impact of over eating on him. Our Amul Baby was always lost in space and time but she was never asked nor she was a Thakurain in the House. Girish Mahajan--our Bjp's Akshay Kumar the lady killer-- wore a suit on the day of reservation announcement often sweating in places I don't want to mention in public...but yes, he did it publicly. इचलकरंजीच्या माजी खासदार निवेदिता माने यांनी, मी देखील शिवसेनेत दाखल झाले आहे असे धैर्यशील यांच्याप्रमाणे जाहीर केले नसले तरी त्याही मनाने आणि शरीराने यापुढे शिवसेनेतच पुन्हा एकदा आल्या आहेत हे नक्की, आणि माने माय लेकाला पुन्हा एकदा शिवसेनेत आणण्याचे श्रेय दिवंगत बाबासाहेब कुपेकर यांचे पुतणे आणि कोल्हापूरातले शिवसेना नेते संग्रामसिंग कुपेकर यांना जाते. ऐन लोकसभा निवडणुकीच्या तोंडावर माने कुटुंब शिवसेनेत गेले कारण उघड आहे, जवळपास २००९ नंतर शरद पवार किंवा कोल्हापूर जिल्ह्यातील राष्ट्रवादीचे प्रभावी नेते हसन मुश्रीफ यांनी त्यांना जवळपास अडगळीत टाकलेले होते, राष्ट्रवादीच्या देशाच्या महिला अध्यक्ष म्हणून त्यांची कामगिरी अगदीच सुमार ठरली त्यातून त्या पवारांच्या मनातून उतरल्या असाव्या असे दिसते किंवा त्याचवेळी माने यांचे पक्षातले तगडे विरोधक हसन मुश्रीफ कोल्हापूरच्या राजकीय वर्तुळात अधिक प्रभावी ठरल्याने देखील पवार मुश्रीफांना मांडीवर घेऊन प्रेमाने गाल धरून बसले असावेत. अर्थात हसन मुश्रीफ हेही या राज्याचे एकेकाळी मंत्री होते सांगणे येथे आवश्यक आहे कारण एक मंत्री म्हणून त्यांची कामगिरी बऱ्यापैकी सुमार होती. ते मंत्री होते हे देखील जनतेला स्मरत नसेल जसे फडणवीस मंत्रिमंडळात दादा भुसे राज्यमंत्री आहेत हे तरी कुठे लोकांना माहित आहे ? रमत नाही, ते का रमत नाही, हे मला माहित आहे पण त्यावर येथे चर्चा नको, पण आता याच संजय काकडे यांची पावले म्हणे इंदिरा काँग्रेसच्या नेत्यांच्या घराबाहेर उमटू लागलेली आहेत, अर्थात असे कितीतरी संजय काकडे किंवा प्रसाद लाड या राज्यात या राज्यातल्या राजकारणात आहेत. कधी आर्थिक तर कधी राजकीय प्रसंगी नुकसान झाले तरी पक्षांतर करायचे नाही, निष्ठा जपायच्या असे मानणारे फार कमी आहेत. एखाद्या वेश्येसारखी गिर्हाईके बदलणारे नेते केव्हाही राज्याच्या राष्ट्राच्या दृष्टीने घातक ठरतात, असतात. Pleasure was all mine meeting you Mr. Fad!! Meet Mr. Maruti Fad, the gentleman in the centre, working with Minister Dilip Kamble nowadays. 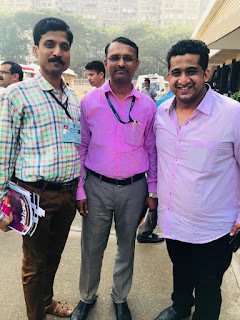 What a day today, 26/11, to get introduced to him by our very own Irshad Bagwan, to the left, who is Asst Director DGIPR --Met them at Vidhan Bhavan today. Well the story goes like this...On the fateful day of 26/11 Mr. Fad was driver to then Secretary to the CM-- Bhushan Gagrani.. Gagrani ji called Fad at around 2;30 in the night to be picked up from Mantralaya for his residence. When the phone rang in the Fad household, the wife was very adamant that Maruti ji should not go for the job tonight as terrorist had already punctured Mumbai and news had already spread like fire everywhere. But committed to his duty, Fad removed his car with a red beacon flashing and began driving. He reached the lane of St. Xavier's College and guess whom does he see right in front of him? None other than Ajmal Kasab. Kasab fires at the car, thinking that the car with beacon must be some VVIP. But apart from Maruti ji, there was no one in the car. At that very moment, Maruti decides to run over Kasab but Kasab had already climbed the footpath and was continuously showering the car with bullets. Unforutantly two bullets brushed passed his fingers (one finger had to be amputed) and one bullet hit Maruti's hips. Maruti knew his end was near, but using his presence of mind, Maruti had locked his car's all 4 doors and acted dead. Kasab came near the car to check his victim, but on seeing the driver dead he tried to unlock the car but failed as the car's doors were already locked. Furious and frustrated from a distance Kasab and his partner threw a hand grenade below the car, but it was the day fate had decided to keep Maruti alive; the grenade skidded below the car on the other side of the footpath and burst. In the meantime Kasab's attention was "diverted" with the car approaching from the front side for which he had to take cover. The car approaching had Late Hemant Karkare and team whom Kasab and his partner killed mercilessly. Maruti saved himself, but even today regrets his inability to save the brave police officers. 1. Minister goofs up big time. You all must be aware that Christian's and Muslims all across the globe support their ideologies by strengthening the party or people carrying the same agenda, wherever you might be in the world. There are agencies and private institutions who support such causes financially big time in form of donations. With this Ayodhya visit and Hindutva agenda, I see ShivSena receiving "GLOBAL FUNDS" to further strengthen their base financially.... I mean nothing is wrong if they do so, but Uddhav ji, here in Maharashtra your partner in your Government is fighting drought, reservation and many more serious issues every single day...To begin with, Late Shri Balasaheb's memorial is still pending. But anyways, "जो दिखता है, वो बिकता है". With elections coming, raising funds is not all a bad idea, whilst supporting the saffron Hindutva tag. A side posting finally to silence the firebrand Tukaram Mundhe. 5. MLA Yogesh Sagar's this side was unknown. येथे अत्यंत महत्वाचा मुद्दा मंत्रालयातील संडासांचा आणि मुताऱ्यांचा आहे, जर राज्याच्या प्रमुख इमारतीमध्ये कमालीची दुर्गंधी आणि अस्वच्छता आहे, मोदींच्या स्वप्नातले स्वच्छ राज्य कसे प्रत्यक्षात उतरेल, राजाचा महाल जर घाणेरडा मग इतरत्र स्वच्छता कशी असेल. एक किस्सा सांगतो, एक दिवस हिटलर त्याच्या पार्लिमेंट मध्ये एक कोंबडा घेऊन आला आणि निर्दयी हिटलर सर्वांच्या समोर त्याचे एक एक पीस खेचून काढू लागला. कोंबडा वेदनेने विव्हळत होता, सुटण्यासाठी तडफडत होता. तरीही एक एक करून हिटलरने त्याची सारी पिसे अक्षरश: सोलून काढली, खेचून काढून टाकली. नंतर त्या कोंड्याला जमिनीवर तेथेच फेकून दिले. तदनंतर खिशातून काही दाणे काढून कोंबड्याच्या समोर टाकून हिटलर पुढे पुढे चालू लागला. तो कोंबडा दाणे खात खात हिटलरच्याच मग मागे जाऊ लागला, चालू लागला. हिटलर सारखे सारखे दाणे टाकत होता आणि कोंबडा ते खात त्याच्या मागे मागे चालत होता. शेवटी तो कोंबडा हिटलरच्या पायाजवळ येऊन उभा राहिला....हिटलरने मग स्पीकर कडे म्हणजे अध्यक्षांकडे बघितले आणि महत्वाचे वाक्य तो बोलून गेला, लोकशाही असलेल्या देशातल्या लोकांची अवस्था या कोंबड्यासारखी असते. लोकशाही असलेल्या देशातले नेते जनतेचे सर्व काही लुटून नेतात, त्यांना लुळे पंगू पार गरीब, मजबूर करून सोडतात. त्यानंतर जनतेसमोर हेच नेते थोडा थोडा तुकडा टाकत राहतात मग असे नेते या अधू जनतेला साक्षात दैवतासारखे, परमेश्वर वाटतात. अमुक एखादा संकल्प सोडायला वयाची कोणतीही अट नसते. फक्त सोडलेल्या संकल्पावर ठाम राहायचे असते. नव्या वर्षात नवा संकल्प सोडूया, सोडलेल्या संकल्पावर ठाम राहूया. इगो, गर्व, लबाड वृत्ती हे तीन दोष सोडण्याचा संकल्प करून तर बघा, कारण हे तीन दोष तुम्हा आम्हा सर्वांना क्षणिक समाधान देणारे असतात पण पुढे हळूहळू हे दोष आयुष्यात नक्की अडचणी निर्माण करतात, भले भले त्यातून संपतात. जे पोटात आहे ते ओठावर आले म्हणजे मागाहून त्याचा त्रास होत नाही पण असे फार कमी व्यक्तींच्या बाबतीत घडते, अर्थात ओठावर आणणे म्हणजे घालून पाडून बोलणे असे होत नसते. हा देश लबाडांचा, फसविणाऱ्यांचा, म्हटल्या जाते, लबाडी न करता मोठे होता येते यावर निदान मराठी माणसाने तरी विश्वास ठेवायला हवा कारण त्याला सुसंस्कृत सुशिक्षित म्हटल्या जाते..